The outdoor tub season is upon us. Get excited. 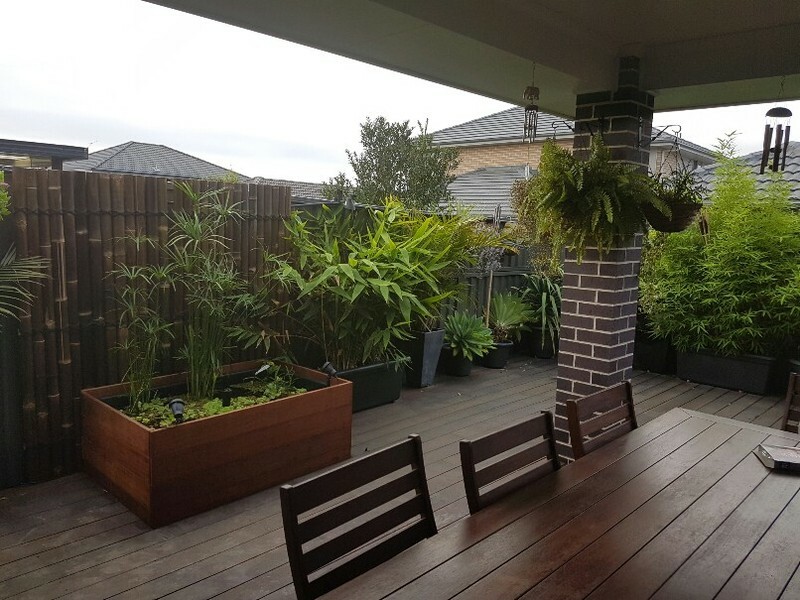 I have a few questions regarding setup - I live in Melbourne and the weather is still quite cold, the temp is still getting close to 0 on cold nights and I expect the temp to be dropping below 10deg for month(s) to come. I want to get my tubs going soon but I'm concerned about the temperature. 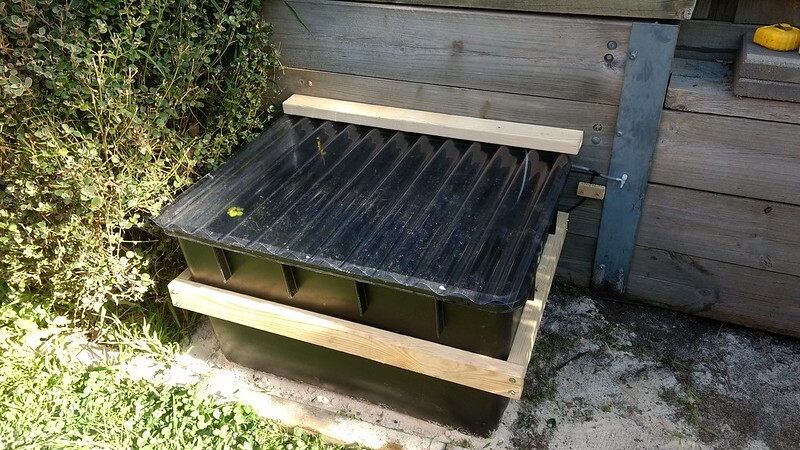 I am just using 220L hydroponics nutrient reservoirs (highly recommend these) http://www.ebay.com.au/itm/BLACK-GAR...-/182198839858 available on eBay or at most Hydroponics shops to save on postage if anyone is after one. 1) Has anyone tried to heat an outdoor tub without breaking the bank? I am going to insulate mine with polystyrene as a start and each night i'll put a polystyrene/plywood lid on. I want to try and add a 25w heater to the bottom of the tub and just leave it on 24/7. This would only cost ~$20 to run for 6 months which is fine. I know it won't heat the water much, but I am hoping it will provide a warm "pocket" of water to sustain the fish on cold nights. Has anyone tried this "patio heater" method? Also, on Grubs' advice, having a tub that's ~60cm deep is an advantage and will help provide a cool/warm zone for the fish, I'm hoping the small heater will help keep the bottom half of the tub a more consistent temperature. 2) Filtration - probably not required, but I am going to add a sponge filter with air stone to keep the water well aerated. Is anyone else filtering their tubs? If so, how? 3) Acclimatising the fish and shrimp. I am going to put my Melanotaenia trifasciata (Coen River) and red nose shrimp into the tub in a hope to promote breeding and give them a more "natural" existence. They are all currently in my main tank, at a constant 23deg. How do I go about helping these guys adjust to life in the tub? Perhaps I will need to properly heat the tub for the first few weeks and gradually drop the temperature? 4) On the topic of my rainbows, what's the lowest temp these guys can sustain? Is it a bad idea to keep them in an outdoor tub in Melbourne at all, even in the warmer months/with some heating? Any thoughts or help with the above would be great - please also use this as a place to discuss outdoor tubs. Last edited by sweefu; 06-09-17 at 11:45 AM. 1) I think Grubs does this. Deep water is a good thing. Be careful of direct sun with shallow water. Everything will cook. 2) flow will be important more than filtration which the floating plants should provide. Perhaps consider a little solar pump depending on power requirements etc. 3) If possible switch off your heater now so that the temperature drops a little more. Then you can acclimatise better. Just be careful with various electrical stuff outdoors. You can put the wires inside an old hose or PVC to protect them from weather etc. May the tubs keep you happy. I'm hoping the small heater will help keep the bottom half of the tub a more consistent temperature. It won't because of convection. The warm water rises and is replaced by cold water. The only warm pocket will be in the rising water directly above the heater. The convection will mix the tub such that the heater will be trying to heat the whole 220l volume. I suspect a 25W will only add a couple of degrees when its <5C at night but your insulation should help. Air and/or filter flow is great when the weather is warm - but its your enemy when the weather is cold. You want the water to be stationary so it stratifies and you get a warm layer at the surface the fish can exploit. Of course it depends on the fish - I have pygmy perch and galaxids that sit in the cold water at the bottom and love it so these fish can have air/filters. The Honey blue-eyes hug the warmer water at the surface and I know 8C is pushing it so no filter for them. Even a windy day will mix the water - I put glass over my honey blue-eye tub to keep the wind out and provide a little greenhouse heating - which only works if the sun comes out. 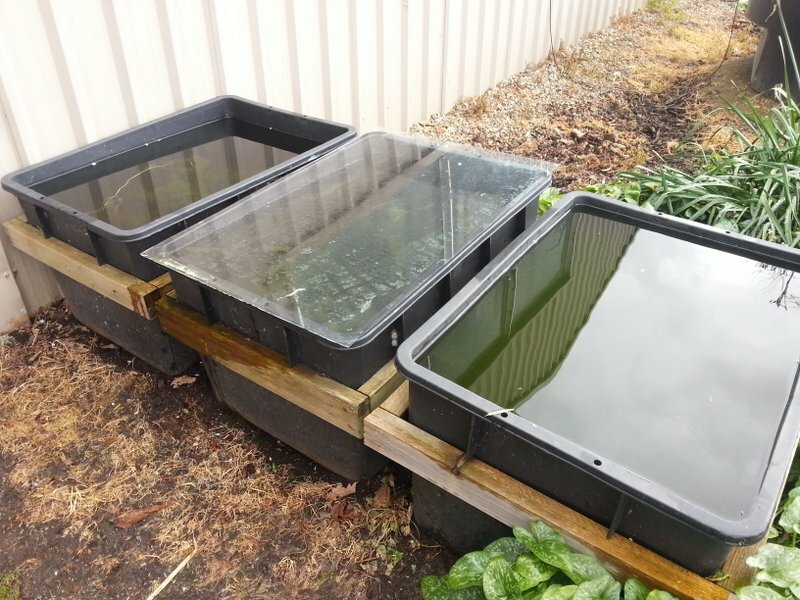 Yesterday the surface water under the glass was only 10C, but the uncovered tub next to it was 8C (no heater)... so it works but you still need cold tolerant fish. When the sun comes out the surface water can get up to 15C+ while the bottom of the tub is still <10C. Perhaps you could lay the heater sideways just below the surface (e.g. sit it on some bricks) The heated water will then form a layer of warm water that floats on the denser cold water. Not sure how this will suit the M. trifasciata. The surface water exposed to the cold night air it will cool rapidly - so then you need a lid. Twin-wall polycarbonate is a LOT safer than glass and provides insulation if you tape off the open edge to seal in the air. All that said - I have some CPDs in 8C water (existing - not necessarily thriving).. and I know people who have kept rhads and spotted blue-eyes outside over winter in Melbourne. ... Of course in another month..or so... we'll be laughing... and by Jan we'll need frozen water bottles to keep the temps down! Set the tubs up ASAP so they can "mature" and start recording surface and bottom temps so you know where you're at... and report back some numbers! If you can get some morning sun all the better both for temps and for stimulating breeding. Edit: Just wanted to add that once the water warms up adding some air with/without a sponge is a very good thing. Water holds less oxygen when warm and once you get to the middle of summer there is a tendency for stagnant water to get bacterial bloom which rob the water of oxygen further. Last edited by Grubs; 08-09-17 at 08:18 AM. I have tried this over the last 12 months in Penrith (Western Sydney) with a load of success. My pond is about 530L and is also an above ground pre-fab type. I did have plans to bring in the fish over winter but decided on experimenting with dropping a 150w heater in there. I found it was able to keep the water at 19C or above even when we were getting nights below 0C. The cost was not overly noticeable on my power bill, however I have had Solar now for over 12months as well. here is a link to the post I made a few months ago here. If you have any questions, feel free to message me and I would be glad to help out! Last edited by mdk54; 09-10-17 at 10:56 AM. I thought we were over the hump but these last few cold nights has my tubs back at 12C. C'mon sun! o Im interested in this too after seeing some youtubers doing it, what kind of fish would be good to keep over the warmer months? 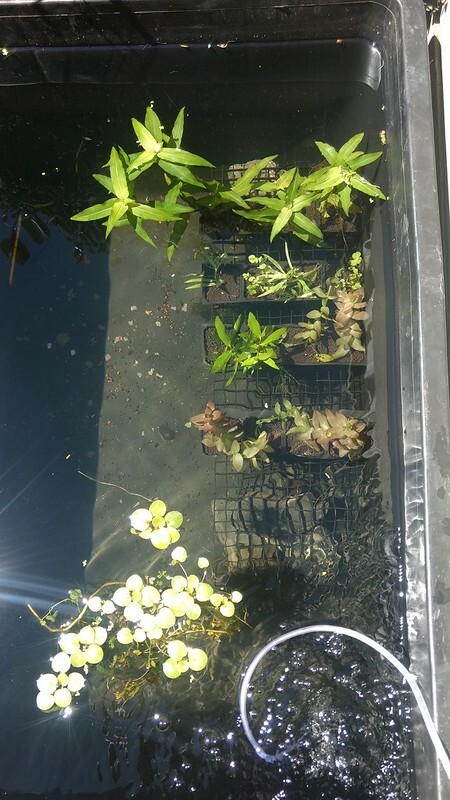 I have a 500L tub with lilies and Amazon frog-bit in it with some others, had some cherry shrimp over winter in it fine. It has a double walled greenhouse sheet over it with flyscreen under that and i can feel the warmth and humidity come off it, but should you have these off when its hotter to get best affect with bugs getting in and stuff or better have it on? Is there and bugs I should introduce and where to get from? I hoping to put in some spotted blue eyes or other small fish? why the flyscreen under the polycarbonate? if for shade to prevent overheating it might be better on top of the polycarb. Once the weather is a bit warmer (this week!) I take any covers off an just leave my tubs open otherwise they can get too hot and oxygen starved - the breeze blowing over the water is an important source of mixing when you don't have aeration. I got my first tub set up properly, picking up the second tub tomorrow. Last edited by sweefu; 16-10-17 at 11:36 AM. Can I ask what the pros are of having an outdoor pond (a part from being fun) I like the idea but curious as to other peoples motives? For me it's a good way to breed fish - creating a more natural environment with live food etc. Also a cheap way to grow plants using the sun. I pop java moss with rainbow fish eggs in them. They seem to hatch and survive better likely due to micro foods. Some fish keepers suggest a fluctuation of day and nighttime temps to keep fish healthy. That happens outdoors a bit. Also despite being hot in daytime outdoors will cool down better than indoors at night when it gets really hot for a few days. Apart from everything else it extends available space, more things to play with. Someone last month sold 14 of these for $10ea and one person snapped them all up. Anyone from here? Also worth noting Bunnings have smaller 85L tubs for $22 at the moment, they looked pretty sturdy too. Not nearly as good as Grubs' find though! Will these shallow ones be deep enough to keep a stable temperature outdoors, without a heater?